Since I moved about a mile or more northeast, the shortest distance to a grocery store puts me at a market that has surprised me with its abundance of great organic produce and a section called “Huckleberries” within it that duplicates much of what I can get at the co-op. On icy days or second walks in the early almost dark of winter, it’s often the destination Romeo and I choose to stretch our legs, warm up for a few minutes and pick up some extra greens or sweet potatoes. It’s bigger than the co-op, so I’ve made it my new “job” to try and discover new things in it each time I go. But the subject of this post came about when I discovered another product I’d read about in McDougall territory–the low fat peanut butter powder called PB2. Always the skeptic, I could not imagine why it would be worth it to buy this if I just wanted to use a little bit of peanut butter. But the new year is a good time to try new things, so when I saw it on the shelf in the Huckleberries part of the market, I decided to try it out. And it is, to my taste, delicious. And without the saturated fat, much easier for me to digest and handle. Better yet, it allowed me to try out another idea I’d read about on this Engine 2 blog post about Cranberry Love. There’s a recipe for sugar free cranberry sauce on that blog post, with a suggestion to have it with oatmeal (not likely since I’m into the simplicity of my fig and twig tea oatmeal these days), and another to try it with nut butters for a different kind of PB and J experience. That caught my attention. 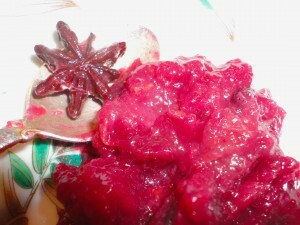 I did do a little tweaking to the basic cranberry sauce recipe given on the E2 blog, and I’ll share that with you here. As directed in the Engine 2 blog post, put all these ingredients in a small sauce pan. Bring to a boil, and then let simmer until it is similar to the consistency of chunky applesauce. Engine 2 gives the option of mashing it with a potato masher for good measure. I decided to do this to good effect. Notes: the main difference in my version is the addition of star anise. It’s kind of an unusual spice to find, but I’ve been putting it in cranberry sauce for decades, after my chef sister shared a recipe they made with orange and star anise in an upscale deli she worked at long ago. Its unique licorice-like taste goes well with the tartness of cranberry and citrus. Just be careful not to bite down on it, or pieces of it, once you are enjoying the sauce. Fish it out or be on the look out. The pulverized orange is my addition, too, which I first read about while perusing homemade bread recipes on the web. It is simply a small orange or clementine, stem end and large seeds removed, pulverized in the blender. I don’t have a high power blender so I chopped mine in chunks (yes, peel and all) and the put it in the blender on “chop.” It came out perfectly and is a splendid addition not only to this sauce, but to a version of my Millet and Raisin Scones made with blueberries. It also makes Susan’s already fantastic chia seed eggnog (which I plan to have for my birthday) sing in yet another tasty key. To clarify, you do not have to stand over this sauce while it reduces and stir it constantly. An occasional stir is fine. You do not have to take the one star anise out at all if you don’t want to, until you are serving, or you discover it in a spoonful you will put on your sandwich or your oatmeal or your mashed potatoes. Generally speaking, if you put a whole star anise in, it will not break apart while cooking. I mention the pieces because sometimes they are already broken in the package they come in. A word of caution: these salad dressings and PB2 products, though they have been recommended by the McDougalls (but not by Jeff Novick), are processed foods. I use them in small amounts. A little does not make me want to dump the whole jar or bottle into a recipe and eat it all. They do not contain oil, or dairy or gluten or high fructose corn syrup. 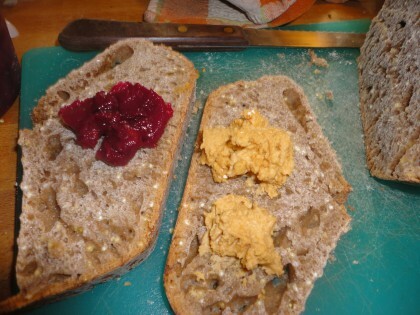 The salad dressings contain no sugar, the PB2 has a little. They aren’t terribly salty either. But if you are a person who has trouble using small amounts of processed condiments, or if your particular health condition flares with even a little processed food, then these products might not be right for you. If you can handle a little, though, it’s nice sometimes, as my son said in support of my use of these products, “not to have to make everything.” Amen. I have been using one called Just Great Stuff which has an organic variety. I buy them by the case and use it in oatmeal, in cookies, sauces, etc. Love that I can have PB again!! Have a special day – I saw you got some sun, yay! Hi Veronica–happy to pass on the finds! 🙂 I think this cranberry sauce would be just fine with only cinnamon, too.